NOC Liverpool, has the longest established Deep Ocean Lander group in the UK. With over 40 years Bottom Pressure Recorder (BPR) design experience and over 240 deployments, mainly of one-year duration or longer. The landers range in size from the small two-capsule RAPIDLander right through to the large instrument platform MYRTLE-X. The landers developed by the Remote Sea Levels Group (RSLG) have been used mainly for shelf-sea and deep ocean bottom pressure measurements. The very first BPR (or Mk1 Offshore Tide Gauge as it was called then) deployment took place in July 1969 in the Hurd Deep (a channel between SW England and France) for two weeks at a depth of 100 metres. The first deep ocean deployment took place in September 1973 in the Iceland/Faroes Channel for one month at a depth of 1200 metres. Later the instrument was used at depths of 4000 metres. Development during the 1970s was very rapid. This was due to the availability of low power electronics, better pressure transducers and high capacity batteries during this period. By 1977 the Mk4 had been developed and this had the capacity to be deployed for two years at depths of 6000 metres. The Mk4lander became the the 'work-horse' for the Drake Passage BPR deployments during the 1980s and 1990s, together with the later developed IES/BPRlander. At the turn of the century, there was a requirement for more BPR deployments in programmes such as RAPID. A simpler, more cost-effective lander was required and the CROCUSand RAPIDLander instruments were developed. The CROCUS lander consists of a single 17” glass sphere in a steel tri-pod lander frame. The data logging and acoustic release electronics are integrated into the one sphere. For the RAPID exercise a twin 13” glass sphere lander instrument was developed. All the electronics was contained in one sphere and all the batteries inside the other. This meant that the instrument could be recovered, the battery sphere exchanged for a new one and the instrument quickly re-deployed. The largest BPR lander that we have developed is MYRTLE(Multi-Year Return Tidal Level Equipment). MYRTLE was developed to improve the quality of sea level data records. Pressure sensors are subjected to immense stresses when deployed at an ocean depth of 4000 metres. There is a change from 1 bar (atmospheric pressure) at the surface to 400 bars (400 times atmospheric pressure) on the sea bed. This tremendous change causes errors in measurements that decrease with time, the longer the sensor is left on the sea bed the better quality is the data recorded. MYRTLE allows the pressure sensor to remain on the sea bed for a long period (for example 5 years) and to send the data back to the surface contained in glass spheres, literally a 'message in a bottle'. MYRTLEhas 4 releasable data capsules and can release these on command from a surface vessel or by means of an automatic timed release and the data recovered by means of a satellite transmitter when the capsule is on the surface. MYRTLE was first deployed in 1992 for four years, giving NOC the world's longest deep ocean sea level measurement record. It was deployed again in 1999 for another four years and recovered successfully in 2003. 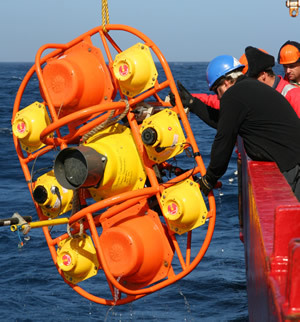 It was deployed again in 2005 and due to be recovered in late 2011. Under development is a new long-term lander called MYRTLEX, with a duration of 10 years on the sea bed and fitted with 12 releasable data capsules and was displayed at Oceanology in March 2010and at Ocean Business in April 2011.